The new little chickies are out mingling for a couple of hours a day in the big chickens' pen, but in order to let them have this bit of freedom one of us has to hang out down there with them to make sure they don't, well, fly the coop. So it's about time to get out the scissors and clip their wings. I have such mixed feelings about doing this, especially after the way some of our last chickens were killed by a dog. I know that if their wings hadn't been clipped, they could've flown up into the trees (I know this for sure because I saw two dogs chasing wild turkeys on our property and even the big ol' Tom turkey managed to hoist his body up into a tree in time to not be eaten). I also hate taking away the freedom of flight that must be a wonderful part of being a bird. Maybe I think about this kind of thing way too much, but it makes me sad to remove their ability to lift above the earth just when they're discovering it for the first time. And I know that once I remove that from them, they won't even remember they have it. Our older chickens have molted and grown back their flight feathers, but they never fly anymore. I don't think know that they can. On the other hand, we live in an urban environment, and it's a blessing at all to have the chickens. I don't want to aggravate the neighbors with chickens flying in to decimate their vegetable gardens, and I know that we're lucky to be able to keep them here at all since many other cities don't allow people to have chickens. So I'll go out with the scissors and feel a bit sad as I remove their flight feathers, and then probably feel relieved that I don't have to babysit the chickens and they can at least roam freely within their large pen. On May 16 at 7:00 pm in locations all over the United States and in several other countries, a Ride of Silence will be held in honor of those who have been injured or killed while cycling on public roadways. I am planning to do this ride, probably with the kids. I think it's a good idea to bring attention to this issue during Bike Safety Month (May). As someone who puts a couple thousand miles a year on various bicycles the issue of cyclist safety is never far from my mind, especially after the death of a local triathlete in May of last year in a collision with a truck on a commonly-ridden cycling route. A friend of mine said that the other day she was biking home on her tandem (after dropping her daughter off at a class) and several people commented on her empty back seat. I have had this experience too, when I am around town with the tandem stoker's seat unoccupied. 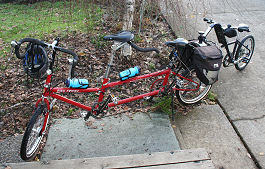 An editorial in a local newspaper said something recently like "We've noticed that there are lots of people riding around town without a person on the back of the tandem. What's up with that?" So, just out of curiousity, when was the last time somebody said to you "Hey, I noticed you drove here with three empty seats. Where are your passengers?" (which, now that I think about it, is a much more relevant question! )I think bicycles have reached the point in many people's minds of purely being recreational vehicles: something you take out when you need exercise, go ride, and put back away. Bicycles are transportation too! Especially for those of us with kids who don't feel comfortable with them riding on busy streets behind or ahead of us. It would only take one distracted swerve in front of a fast-moving truck, or a failure to notice the car pulling out of the driveway for a catastrophe to occur. On the tandem, we're all riding on my line, and at least I have some control over that. And on that note, I'm not sure how current this is, but this legislation just came to my attention from the League of American Bicyclists Bike Advocacy Center. It is seeking to amend the IRS tax code to extend the transportation fringe benefit to bicycle commuters. It might seem like a small thing, but it's really about time that bicycles are reintroduced into the public consciousness as the vehicles that they are. When I used to commute to work on my bike in the city of Redmond, Wa (suburb of Seattle and the self proclaimed "Bicycling Capitol of the Northwest" - hah!) I would rarely see another cyclist on the roads. No surprise as much of my commute was on streets with no bike lanes, sharing the road with drivers who were either unused to cyclists, or openly antagonistic (that .05 nanoseconds it takes to go around a bicycle can really put a dent in your commute, can't it). But I hear that Seattle is going to increase their bike lanes by 800%, from a paltry 25 miles to over 200. According to the article I read, the plan "anticipates a huge increase in recreational and commuting bicyclists" which can be nothing but good news for health, environment, and of course the looming spectre of climate change. So for those of us riding on the original sport utility vehicles, hopefully the winds of change are blowing our way (at our backs of course). Our baby chicks are now teenagers, with most of their adult feathers and a few of their fluffy baby feathers still sprouting out here and there. They look gangly and awkward, and they have attitudes, just like human teens. Cleopatra (not pictured here, but she has black "eyeliner" around each eye) is emerging as the leader of the flock, pecking me whenever I get too close and challenging everyone else to regular "chicken jousts" (where they run at each other and then flap up in a fury of wings). Sapphire, my daughter A's Blue Andalusian (the greyish blue one on the left) is the sweetheart of the bunch, and Bingo (the creamy colored one) and Ra (all black) seem to be the group's brightest bulbs. They're starting to fly around a bit, which makes things interesting when I'm trying to put food into their feeder and not have fledglings flapping around the garage. Their chicken instincts are solidly in place, a recent visit by an overflying raven caused them all to freeze in mid-peck for at least a minute until the threat was gone. All in all, they're endless entertainment as they grow and change.